The Oster Oven with Buffet Server is the creme de la creme when it comes to rotisserie and roaster ovens. This 18-quart roaster oven has a sizable capacity with enough room for an 18-pound turkey, which can help save room in your regular oven for roasting veggies and other sides when you’re prepping a big meal. But this versatile roaster isn’t just for cooking meats: use it for baking, slow cooking soups and stews, or serving up any number of your other foodie favorites. The Oster Oven with Buffet Server has three removable enamel-on-steel pans and lids, a handy removable steel rack, and a secure-fitting lid specifically designed to trap moisture and heat during the cooking process. For home chefs on the hunt for a bargain-priced roaster oven, the Oster 18-Quart Roaster Oven with a High Dome Lid is a near-perfect product. 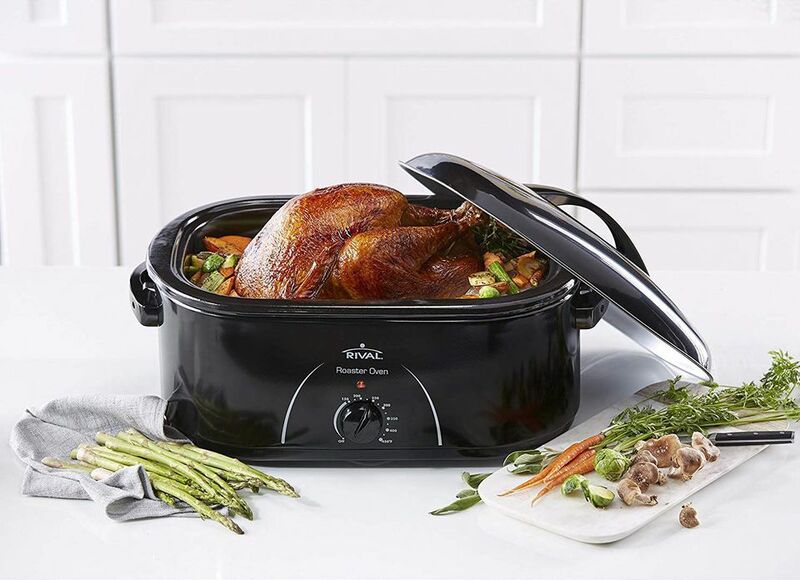 Free up the main oven for cooking yams and pies with this time-saving roaster oven, which can fit a 24-pound turkey—you won’t even have to baste it, since the Oster oven is designed with a self-basting lid that effectively traps steam, keeping the meat tender and moist. This affordably priced oven has a removable steel rack and removable roasting pan, for convenient removal. The Oster 18-Quart Roaster Oven with High Dome Lid is made of gleaming stainless steel, comes in silver or black, and measures 17" x 24" x 8". If you want a rotisserie that does a lot more than just spin food on a spit, this might be the perfect, affordable choice. It can hold up to a 5-pound chicken on the rotisserie, but you can also remove the spit and use this as a traditional or convection toaster oven with the two included racks. It can fit two 12-inch pizzas, two 9x13 casseroles, or two cake pans. It has both bake and broil settings, and has a two-hour timer. Sleekly designed and ultra-chic, the NutriChef Upgraded Multi-Function Rotisserie Oven is easily the best high-end roaster oven on the market. This gleaming, highly functional oven provides the perfect flavor and texture to your meat, thanks to its array of high-tech features that include a rotating kebab rack, multi-function cooking ability, and a high-powered, 1500 watt heating element. Easily adjust the temperature and time, and prepare your food quickly and effectively with this roaster oven, which comes with (in addition to the kebab rack) grill racks and bake pans, and is very stain-resistant and simple to clean. The NutriChef Upgraded Multi-Function Rotisserie Oven has a maximum temperature of 464 degrees and a capacity of 24 quarts. This professional roaster oven has a unique “circle of heat” heating system that cooks the food from the sides rather than the bottom, so food stays juicy and cooks more evenly and you don’t need to worry about food burning on the bottom of the pan. It also means there’s no need for a lot of stirring when you’re using it for soups or stews. You can choose a temperature from 200–400 degrees Fahrenheit using a simple dial with easy-to-read temperatures for baking, roasting, steaming, warming, and slow-cooking. The chrome rack has handles that make it very easy to insert and remove hot foods. This roaster has an 18-quart capacity and can accommodate up to a 22-pound turkey. The exterior and lid are stainless and the cooking well has removable cooking pot with a porcelain coating for easy cleaning. If you’re preparing to cook a bigger-than-average bird, investing in a large-capacity roaster oven is worth it: enter the 22-Quart Oster Roaster Oven, which is ideal for roasting, slow cooking, or baking any turkey that weighs up to 22 pounds. This spacious, sleek roaster oven is certainly sizable enough to hold most meats and other foods (measuring in at 23" x 17" x 9"), rendering it the perfect cooking tool for large social gatherings and the holidays. The 22-Quart Oster Roaster Oven features easy-to-use temperature controls that allow you to set the temperature for anywhere between 150 and 450 degrees, plus an enamel-on-steel roasting pan, a lid rest, and a removable steel rack. This roaster does more than just roast—you can use it to sear foods, slow cook, bake or steam, while the nonstick interior cleans up easily when you’re done. The oval cooking pot holds a generous 6 quarts which is plenty for a chicken or roast. It’s a bit too small for a turkey but large enough to hold the broken-down carcass to make soup stock. Use this in baking mode to roast the perfect chicken on a rack, then make gravy from the drippings. Sear then roast a rack of pork or sear then braise a pot roast. You can also use this for baking cakes or for steaming vegetables. The glass lid lets you peek at what’s cooking without lifting the lid. This includes roast lifters, silicone mitts, and a travel bag for storage or for transport to a potluck. The Cuisinart TOB-200 Rotisserie Convection Toaster Oven is fast, efficient, and often provides tastier results than a regular oven. This popular convection oven has a .75 cubic-foot capacity (which means it can also fit up to six slices of bread, as well as a 12-inch pizza), and it measures in at 19" x 15" x 12". You’ll have a vast array of cooking options at your fingertips with this oven: use the rotisserie setting to cook a duck, defrost pizza with the defrost function, or toast bagels for breakfast with the toaster setting. There’s even a leftovers function for reheating your meals. An exact heat sensor helps to maintain a perfectly precise temperature, while the oven’s digital controls help make operation as easy as possible. Not to mention, cleanup is simple thanks to the oven’s nonstick interior and removable Auto-Out rack.